The new album released by Generator.pl confirms his position as one of the leading composers and performers of classical electronic music of our time. His music is full of space, you feel an omnipresent air (hence the title), listen to pathetic mellotrones in various combinations of sound and of course the analog fat sequences, exquisitely modulated by the synthetic filters. Some time ago Konrad Kucz told that it would be hard to him to go back to berlin school moods in his artistic creation. The reasons he mentioned are formal, sound and ideological exploitation of this genre. But finally he has just went back. The new album is not like hundreds or even thousands berlin school albums releasing each year - sequence, rythm, solo part and hope to become an EM master. It is not so easy. Becoming recognizable needs talent (that's obvious), hard work and patience. Kucz by years spent at keyboards and sequencers developed his unique style. The new album released by Generator.pl confirms his position as one of the leading composers and performers of classical electronic music of our time. His music is full of space, you feel an omnipresent air (hence the title), listen to pathetic mellotrones in various combinations of sound and of course the analog fat sequences, exquisitely modulated by the synthetic filters. All is very illustrative, perfect for an evening meditation and reflection from the perspective of a comfortable chair. Polish electronic music has been enriched by another export album that will satisfy every music lover around the world. Brilliant 2015 album connecting the Symphonic & Rhythmic "EM" styles perfectly and containing classic, lush Tangerine Dream Rubycon inspired Mellotron choral sequences! This is the 3rd Album from this Polish synth musician, and it is, by a mile, his best work to date and also one of the finest releases on this Polish "Electronic Music" label! Featuring classic spacey synth sounds, Mellotron textures from the Tomita Snowflakes / Tangerine Dream Rubycon eras, this album is ethereal, symphonic and to some degree rhythmic as well. It is very much a "cosmic" album that is abundant with atmosphere and melody throughout and it climaxes with a track that is unlike anything else on the record and sounds as if it could be an epic OMD track! Some time ago Polish musician Konrad Kucz revealed that it would be difficult for him to go return to "Berlin School" moods in his artistic creation. The reasons he gave were formal, sound and an ideological exploitation of this genre. But finally he has returned, and with an album that's unlike the many other "Berlin School" style albums released each year! Becoming recognizable needs talent (that's obvious), hard work and patience. By spending years in front of keyboards and sequencers, Konrad Kucz has now developed his unique style. 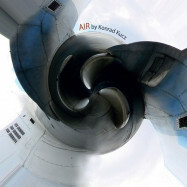 'Air' confirms his position as one of the leading Polish composers and performers of classical electronic music of our time. His music is full of "space" and it is delivered in such a way that you feel an omnipresent air (hence the title). Air: First Movement opens up in space with all manner of electronic effects before blossoming out into this panoramic display of gorgeous mystical choral voices (Mellotron 400 sounds) that soar, swell and sway though the upper atmosphere to heavenly effect, before returning to a collage of synth effects that are a little reminiscent of early Tomita. It then moves into a new, more "Berlin School" area of sound where repeating synth melody lines wondrously dance around in the atmosphere until a sequencer line comes over the horizon and interacts with the dazzling effects. It all gets a little manic as they all collide and disperse in a burst of light to reveal an altogether more sensitive sequence juxtaposed with a slightly more discordant sound. Great opener! Silver Clouds opens with a more classical sensitivity with the sound of a synth (I think) oboe tune and then blossoms out further with the addition of angelic synth harp sounds and added Mellotron strings, taking on a more cosmic feel as choral voices flood the soundstage with an ethereal atmospheric quality. Towards The Sky features a carnival or sounds and textures and is lightly rhythmic at first as it sprightly dances to sounds sketches of crystalline synthesizers and sequences. Soaring Angel is a symphonic tone poem that starts out in a sombre floating in space mood, but as little bursts of synth sunlight appear, a hole in the hazy, dream-like atmosphere appears, and sweet alien-like voice melodies flow through. Soft organ textures roll around for a while then more angelic beams of sound form a kind of celestial sunset and the alien choir appears once and closes the track abruptly. Air: Second Movement brings the return of the vast choir of heavenly voices of the opening track and a sequencer, to some extent, then delivers a rhythmic drive to the track with background organ and string synths proving an ethereal backdrop. The Mellotron choirs once more add their bit to the final passage and here we are firmly in Rubycon final movement territory! Rising Sun open in a new part of space, with a phased mix of angelic voices and effects creating a cosmic montage of sound that gives a real feeling of being "out there" in deepest dark space. The final two minutes form a gorgeous symphonic space theme with massed string synths and choral sounds enveloping the atmosphere before ending abruptly once more. Let It Out is the sound of a revolving keyboard melody line backed by string-synth textures and that's it! Daybreak moves bank into deep space textures, but it too is an equally short piece. Long Distance starts with effect ridden organ chords that form a simple but extremely effective wall of cosmic sound, then swirling ecclesiastical voices come in and surround it with a warm heavenly glow. Under The Blue Sky closes the album with a space-synth drum sequence that all of a sudden envelopes and bursts into a panoramic theme that I can only describe as being a bit similar to OMD's big Mellotron driven epic: Joan Of Arc, with key changes and all! Air is complete escapism - an extremely enjoyable album that will take you out into the cosmos on a just over forty-minute trip where you'll forget all your worries and woes and enjoy the beauty and thrill of a space trip like no other!